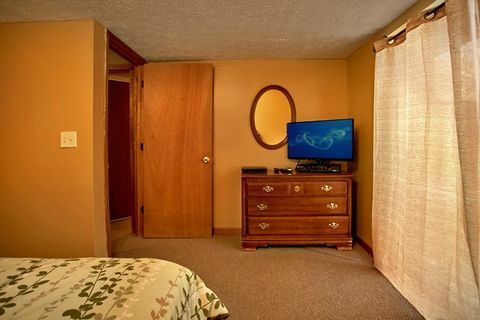 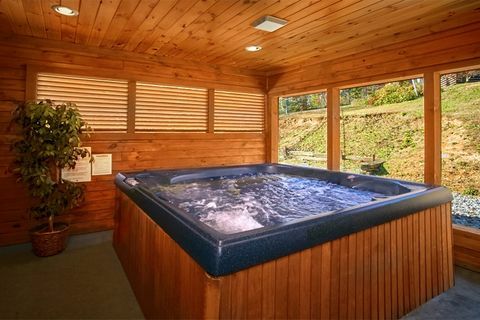 "Family Gathering," a big family cabin near Gatlinburg, accommodates up to 28 guests and provides such features as a resort swimming pool, a private indoor cabin hot tub, Wi-Fi Internet, and several other family-friendly amenities that are sure to make your stay in the Smoky Mountains the most memorable occasion. 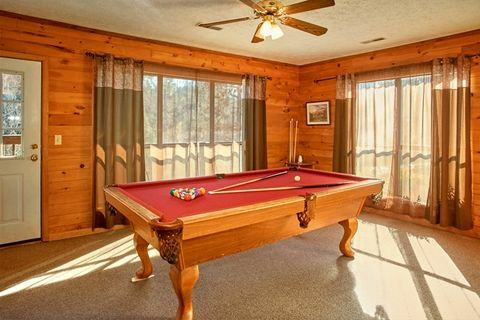 Your big family cabin places guests in an ideal location next to the Mountain Park Resort swimming pool. 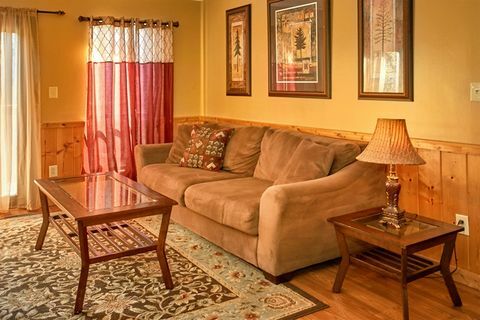 Additionally, this large group cabin rests a mile off the action-packed Pigeon Forge Parkway that offers some of the most visited attractions, dinner shows, restaurants, and seemingly endless adventures. 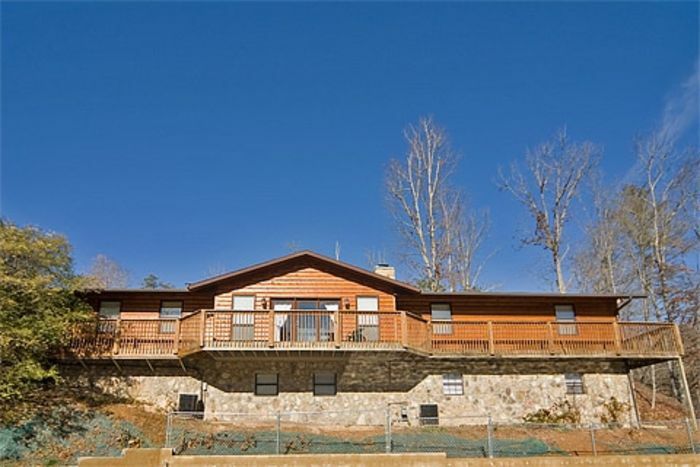 "Family Gathering" gives guests a large, two-level, ranch-style cabin with 7 spacious bedrooms that each offer their own television. 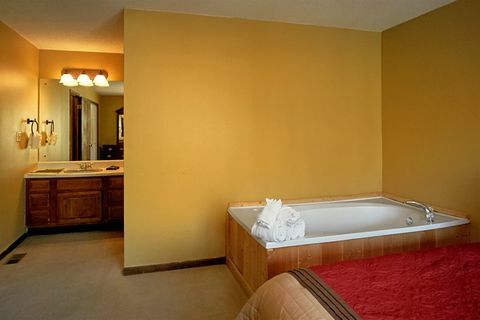 As you enter your lodging, the large family-sized, indoor hot tub rests to your left and nearby there's a full-size pool table. 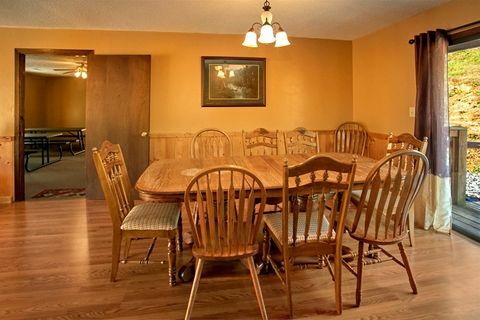 Moving forward, you pass through the very large dinner hall with 4 tables into the second dining area next to the open kitchen that peers out over the spacious living area with a large, wood-burning stone fireplace. 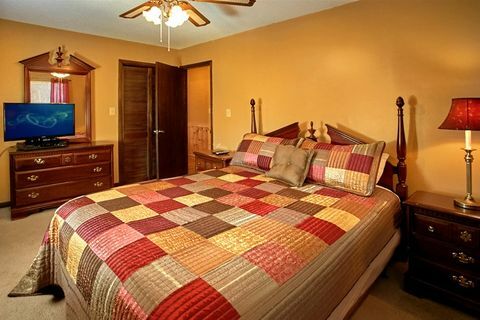 Beyond this area, a hall leads to the master bedroom with king size bed, an in-room jacuzzi, and private bath. 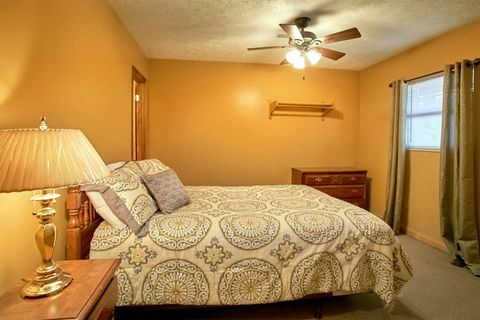 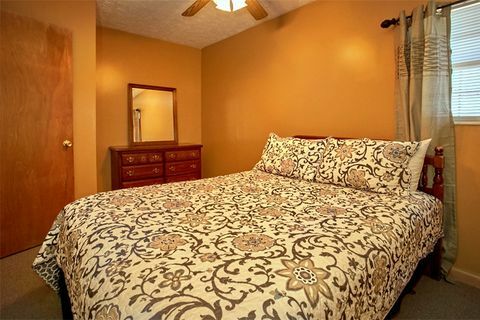 Across the hall from the master bedroom are 2 bedrooms with queen size beds and a full bath. 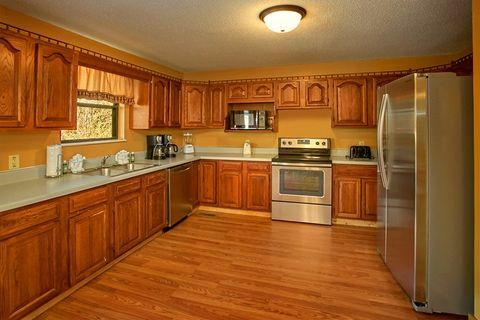 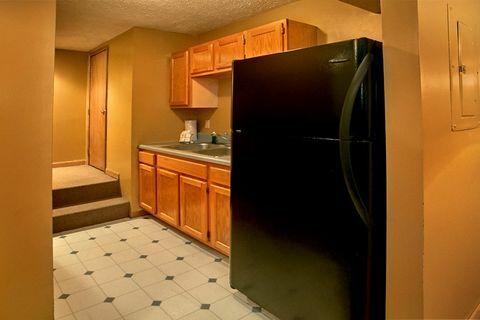 On the lower level of your big family cabin, you first enter the kitchenette area leading into a hallway. 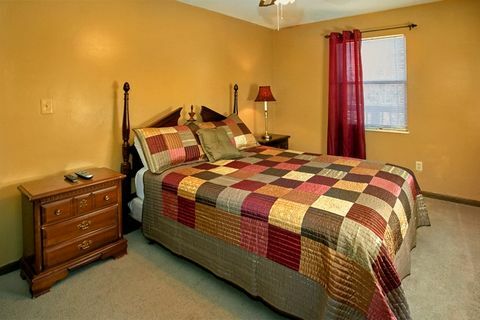 Off to your left are 3 bedrooms - 2 with comfortable queen-size beds and another with a full-size bed. 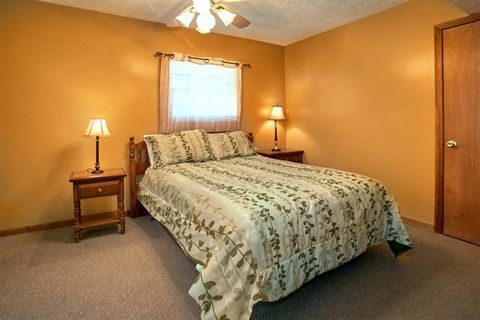 One of the bedrooms has a private bath while the other bedrooms share the full-size hall bath. 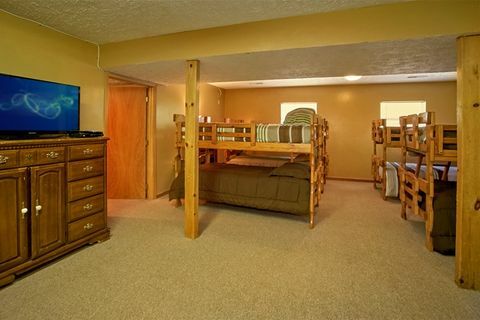 At the opposite end of the hall is a massive open room with 8 sets of bunk beds, a fireplace, and television. 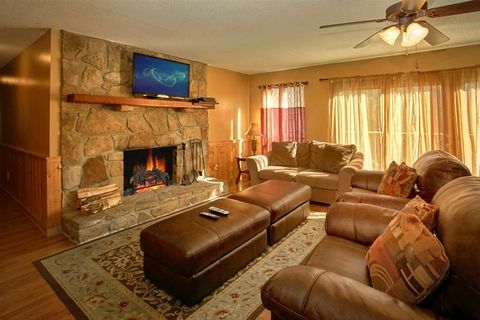 Your cabin also provides an outdoor fire pit, so you can enjoy a nice evening of roasting s'mores and sitting out underneath a starry sky in the Smoky Mountains. 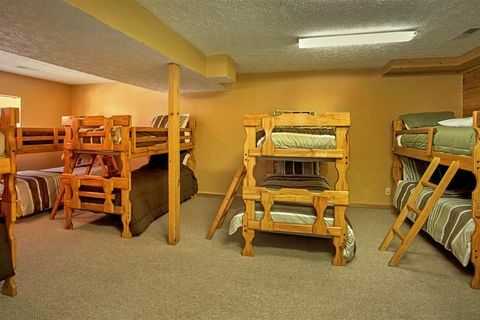 "Family Gathering" provides the ultimate big cabin getaway in the Smoky Mountains for large groups or family looking to stay together under one roof. 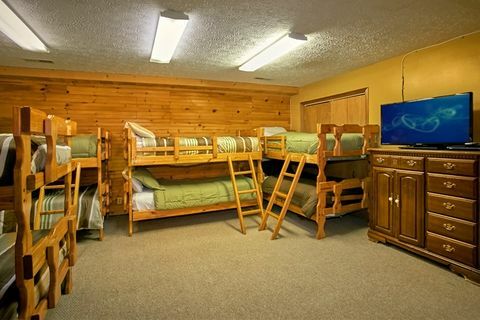 Book "Family Gathering" or another big family cabin online to receive your immediate Online Cabin Special and SAVE BIG with Cabins USA Gatlinburg.